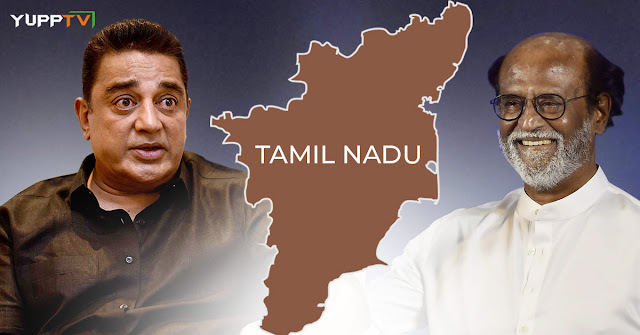 YuppTV Blog: Can Superstars of Tamil Cinema - Rajinikanth And Kamal Haasan bring a political revolution in Tamil Nadu? Can Superstars of Tamil Cinema - Rajinikanth And Kamal Haasan bring a political revolution in Tamil Nadu? Acting Superstars get into Politics all the time. There are many instances in history where we have witnessed such incidents and in many of them, Actors have created history in their term. Telugu Actor NTR, Tamil Actors MGR, Jayalalitha, Hindi Actors Smriti Irani, etc., have been good examples of these. Recently, one of the greatest actors in India, a revered Superstar from Tamil Industry- Rajinikanth has declared his entry into Politics. Another top actor from the same industry who is as reputable as the former across the entire nation, Kamal Haasan has declared a month before Rajinikanth that he would be joining the Politics as well. The Tamil Nadu State which has always welcomed Actors as their leaders cordially welcomed this declaration of both the Actors. The actors are highly distinguished and are worshiped by the people of Tamil Nadu. Both are well -known for their modesty and their ideals of service to People. And Both are known philanthropists and have done plenty of service to the community. The actors have clearly earned their place in the hearts of people with the works other than their acting skills. Taking that into consideration, one might predict that the actors can bring a positive change in Tamil Nadu Politics. On the other hand, the general public has become more educated and is looking for quality in the leadership. While both the actors are sincere philanthropists and have a sufficient following, Politics is a completely different Ball Game and demands more of diplomatic stance. There is an obligation to make tough choices which are not always welcomed by people of various sects. A leader is always bound to disappoint some group of people intentionally or unintentionally. Both Kamal Haasan and Rajinikanth, being great actors have earned a massive fan following from all sects of people irrespective of their personal, religious or political preferences. But, entry into the Politics divides the crowd at the very base. Elements like the party motto, the candidates, the party’s achievements, etc., are bound to create a significant difference of opinions among the same crowd. While the existing popularity can help them to secure some seats, it is highly unlikely that the victory will be consistent among all the areas and vastly different people. So, will they be able to create a legacy like their predecessors, MGR and Jayalalitha? Will they be able to bring that revolution in the Tamil Nadu Politics? These are questions only time can answer. Get all the up to date information on Tamil Nadu Politics on Thanthi TV Live.